Ever been at a beer festival in the UK and had the nagging feeling in the back of your mind that something was missing? There might be great beer, live music, delicious food and yet you’re somehow inexplicably left wanting… more. Well, gentle reader, we may have the answer to your prayers, courtesy of the Belgrade beer festival. The thing we’ve been missing is dodgems. 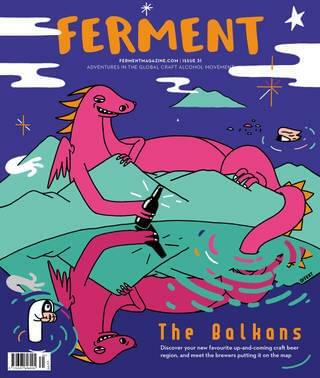 The Belgrade Beer Festival is refreshingly unpretentious – entry is free and it certainly feels like a good chunk of the population of Belgrade pitches up for five days of open-air booze, food, fairground rides, big-stage music and general bonhomie. Vladimir and I arrive on the Thursday night, and there’s big beer everywhere, the familiar logos lit up in neon around the main stage, but we head straight for ‘Craftland’: three large gazebos housing the crème of Serbian craft brewing, large and small, with Dogma at its heart, the bar queue three-deep. On the main stage behind us, is Nele Karajlić, a provocative rock auteur who was huge in the former Yugoslavia in the 80s and early 90s, made his home in Belgrade during the Bosnian war. The crowd is singing along to every song, and he’s just one of a line-up of old and new regional stars who have turned out to entertain the crowds, alongside names more familiar to me, such as Róisin Murphy and The Stranglers. Vladimir is greeting people and introducing me as soon as we arrive, and seems to know everyone on our quick circuit of the breweries. A succession of beers, all served in open-lidded ‘Craftland’ cans are pressed eagerly into my hands, most of which are hop forward variations on a pale ale. I’m pleased to see Kabinet – the other big name in Serbian brewing – has a flashy stand here too, and I spend some time exploring its lineup. Everyone I speak to, including several non-brewers, is fiercely proud of Serbia’s nascent craft scene, and recommends someone else I should speak to, or beer I should try. After a quick bite to eat at one of the superb food stands – US-style barbecue brisket with salad and flatbread – I drift through the sea of Nele fans and into the bright, swaying lights of the fairground. After a few beers it’s an assault on the senses, and I wonder whether combining booze and such high-octane thrills is such a great idea, but everyone seems to be having fun. Deciding to walk back to my apartment across the Danube, I pass by a Frank Zappa-themed floating bar, where a covers band is bashing out classic UK punk numbers with more enthusiasm than craft. While seemingly at odds with the classic central European cityscape on the river’s north bank, the scene is strangely appropriate for this culturally vibrant, diverse and exciting city.